Arrived at the mouth of the Boka Kotorska arround noon and cruised slowly through the bays reaching Kotor mid-afternoon. Fabulous natural harbour. 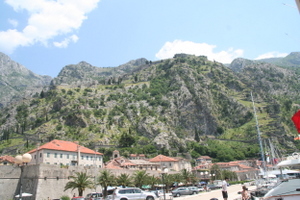 15th century Venitian fort stands high above Kotor with walls leading down to surround the city. Everything has been restored with UNESCO funds and is very smart. Great restaurants and bars. Inexpensive. Had a great dinner at Galleon Restaurant on the harbour E30/pp. Customs and Imigration a bit of a run arround. We had sterned to the town quay and they asked us to return to a custom compound at the tip of the harbour. One must complete forms and pay a fees at the Harbour Authority E120/ week for a Montenegro Cruising Permit before clearing customs and police. The Manager of the Harbour Authority decided to take his groceries home as I arrived saying he would return in 2 1/2 hours (5:00pm). 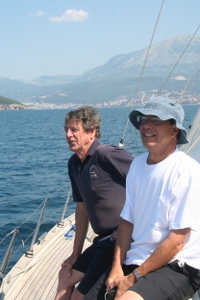 Learning that the Officer had gone walk about, the customs folks let us out of quarantine to have lunch making a comment in Croatian that sounded rather like "what bull..."" Berthing fees E52/ night including water and juice. Crew recovering after late night attack by a drunken visiting Spanish Bermudian who managed to dive off the passarel without bloodshed.